This book describes an extensive research into Critical Success Factors that organisations can adopt in order to improve their CyberSecurity maturity levels. It addresses the concepts of Information Security and CyberSecurity and is substantiated by additional publications the authors have done over the last years. The final set of success factors is reflected via interviews with top Chief Information Security Officers (CISO's) in the Netherlands. This book contributes the academia Body of Knowledge on Information Security as well as providing managers and directors with practical guidance to make their organisation more Cyber resilient.Talitha Papelard-Agteres MSc is Director Business Security at Northwave. Prior to Northwave Talitha was Manager Security Operations at KPN (Telecom). 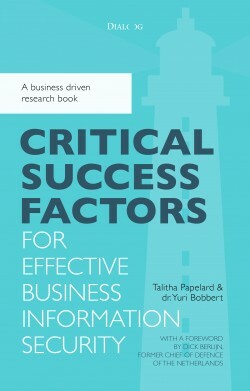 As researcher at Antwerp Management School Talitha did research in Critical Success Factors for Effective Business Information Security. Talitha is lecturer at several universities in the Netherlands. Dr. Yuri Bobbert is the global Chief Information Security Officer (CISO) at NN-Group N.V. Yuri is the former CISO of UWV (Government - Financial services) and prior to his role as an interim CISO he served for 10 years as CEO of a consulting firm. He is visiting professor at Antwerp University and is author of several books and publications in Business Information Security Governance and Management.